High quality semantic search means highly relevant search results. The modern approach towards tuning a complex ranking function is called Learning to Rank (LTR). Machine learning techniques are used to learn from user feedback which search results are good and which are not. The location of a candidate can be for example more important when hiring call center agents compared to SAP consultants. So how does a search engine know when to boost a location and when to boost a certain skill? At Textkernel we aim to solve this puzzle with our Learning to Rank research. When we match jobs and CVs multiple rules will exist. 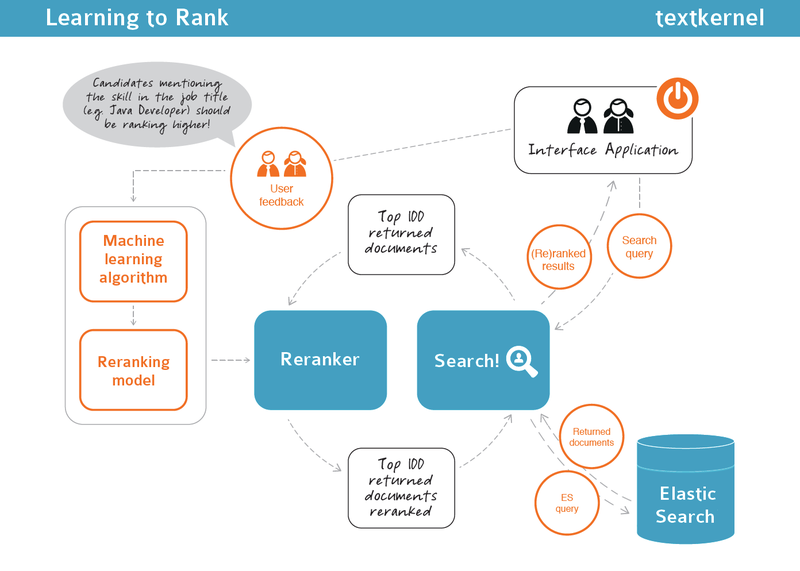 Complex ranking rules are incorporated in a reranking model that is applied on the top K results as returned by the search engine. Learning to rank (LTR) simply refers to training such a reranking model. Machine learning can discover elaborate and non-linear dependencies in the data and use them to generate models that can improve the relevance of search results beyond what can be conceived by human inspection. Being able to machine-learn a model also allows for automatic tailoring of the ranking to a certain user’s preferences. How do we use this within our search and matching engines? For usage within Search! and Match! we have created an integrated reranking library. Internally it consists of two parts: a reranking part that re-orders the results according to the current reranking model, and a machine learning toolkit that can learn new reranking models. The most important part is user feedback. We can gather feedback in explicit and implicit ways, e.g. by asking customers which results are relevant for their query. It can be explicit feedback as simple as a ‘thumbs up/thumbs down’ in the user interface or implicit feedback, e.g. measuring clicks by the user or which candidate has been invited to an interview. Search! has an integrated assessment mode that allows people to give relevance labels to results of a query. We automate the learning of new rerankers with our reranking library, which means we take care of the feature extracting, learning and parameter settings. In other words, with our reranking library, any user can have their own reranker based on their specific data and preferences, provided that they have given feedback by assessing documents resulting from their queries. For more information read the full blog post about our LTR research. Do you want to know more about LTR? Contact us directly!